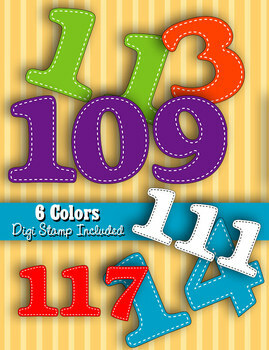 Six number sets in bright colors with a "stitched" border. Each number is 3.75" (inches) high! This set matches the “Brights” Alphabet. Each PDF contains 120, 8-1/2 x 11 pages and there are 120 high-resolution PNG files with transparent backgrounds included in the download. The original artwork is vector art which means that the PDF pages can be printed at any size without losing quality. There's no size limit. Really. These numbers are great for classroom decorations, signage, banners, bulletin boards and wall graphics. 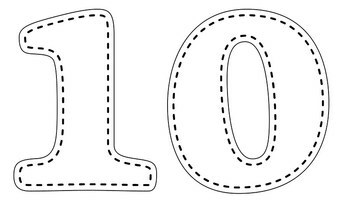 But they can also be sized down and used in smart board lessons, in handouts and materials you create. All images are ©2013, Melody Bastin. All rights reserved. This is original intellectual property and permission is granted to use for personal, educational or small business purposes only. No large commercial use or distribution.